From what and where does thy username originate? Well, Speer is the last name of someone I met once and then never saw again, but whose name stuck with me for whatever reason. And Evran just sounds kind of nice with Speer. Hi, did you have any other username before this? Nope, every day since I joined these forums, I have been Evran_Speer. I see. Nice to meet you. Great! Anyway what time is it on your side of the world? Hey Evran i dont want to clog up the thread anymore but i didnt think you were rude or confrontational and i hope i didnt come across that way either. Just mixed up my wires a bit. Glad to hear it. You didn't seem rude, either, just upset. I was probably picking up on the general tension of the topic and misinterpreted it as being directed at me in particular. Well, see you around. Random thoughts that I don't have a place for anywhere else. 1) When Talon is delivering milk to Hyrule Castle, the nearby boxes, which Link uses to jump of the Hyrule Castle moat, are actually milk boxes, probably the same milk he was delivering! Don't know why I never noticed that before, but it is pretty cool. 2) In the original LoZ, perhaps the Second Quest takes place on an alternate timeline that ended up very similarly. Presumably (unless there's some kind of convergence) the split would have happened not long before this game, but I don't know why that would actually happen. I noticed the first one a long time after first playing haha. It's such an easy detail to miss even though it's right there, for some reason. Hmmmm, maybe the same applies to Hero Mode in the other games, and Master Quest for OoT? It's harder with Master Quest since the whole map is reversed. It's hard to imagine a time other than the creation of Hyrule where things could change that drastically. Maybe it can share a timeline with the Wii version of Twilight Princess. Nah, I'm just A horse god, not THE horse god. Wuzzis about a novelization of Wand of Gamelon you mentioned? I'm interested. Tbh, even the questionable aspects of Zelda lore (that includes cartoon, Captain N, books like Shadow Prince and Crystal Trap, the NP comic, 1980's creepy manga and cd-i) fascinate me, and it's my belief that you can take something of questionable writing quality and turn it into something magnificent. I've even seen it happen. The NP comic was adapted into a Zelda Classic quest and it was tremendous! Then again the comic was better written than the cartoon but even so, it felt like a true Zelda game and not out of place. Oops, I went on a tangent there. Hey, how's it going? You see the future or something? lol, why suddenly the second question pops up? You said something in the "Mind's Eye" thread about seeing things but not being able to prevent them from occurring. It sounds a bit like psychic visions of the future. I've just always been interested in that sort thing. Do you know we can train ourselves to obtain psychic abilities? I've read that in a book at least once. I'm not sure if I really believe it, though; the few people I've known in real life that exhibited any abilities like that describe it more like it just happens to them, rather than them ever training to achieve it. Thanks for reading my Imprisoning War opening. I have all kinds of headcanon stuff and such I wanted to throw in. I was going to spend all night and tomorrow writing it. What's so great about Din, anyway? :0 You're a mod now. Congratulations. Oh, sorry. It wasn't a plot spoiler or anything, but sometimes people like to discover the mechanics for themselves. The tip was that you can climb in the rain by taking four "steps" upward and then jumping up the slope. Then you'll slide down just a little less distance that you jumped, so you get a little more than four "steps" of distance, just at a greater cost of stamina that would without rain. Step, step, step, step, jump, slide. Step, step, step, step, jump, slide. With climbing gear, you can get up to seven steps before sliding down, though I usually jump on six, just to be safe. The fact that people still list rain as one of the main flaws of that game just amazes me. Like the only thing they do is climb sheer cliffs, so every time it rains, they just stand there and wait for it to stop. ...I should really check my notifications more often. lolol, it's fine. No worries! Answered your post in my theory thread! Sorry for the wait. Thanks! I'm pretty busy at the moment, so my response probably won't be prompt either. Sorry for not responding to your post in my theory thread yet. I've had internet problems on and off for the past week, and plan to respond tomorrow. Also, thank you for sympathy... If you wish I will PM later to explain. If not, that's okay, too. Hello, Evran, Just wanted to let you know that I have seen both your comment and Jason's in my theory thread, but haven't replied for lack of being able to upload the pictures on Xomf that I was planning to use. Just letting you know that my pictures in my theory have now been re-uploaded and work fine! I'm following you know so I can contact you easier when I get any other theories out for you. Young Link is pretty awesome, but to my mind, there's just no beating the Link/Midna duo. 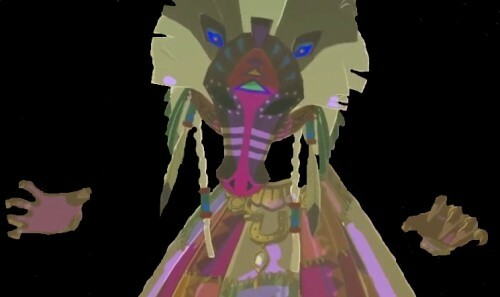 I'm curious as to why you don't think the HMS and Skull Kid in MM are the same ones from OoT. Oh, sorry I never responded to this. I don't pay much attention to my wall. Anyway, since Termina has counterparts of a lot of Hyrule's citizens and the HMS and Skull Kid both have access to the portal and are found either just on the Hyrule side or just on the Termina side, I haven't seen much reason to believe that they are from Hyrule rather than Termina. Though I think someone pointed out that the HMS references the Happy Mask Shop with no indication that such a thing exists in Termina, so there's some indication that he is indeed from Hyrule. For Skull Kid, people like to use that "fairy kid taught me a song in the forest" quote, but that requires that Link performed that action off-screen in the CT and that the Skull Kid who was familiar enough with the song to exclaim "Hey! You know Saria's Song!" -- implying that he already knew not only the song but Saria herself -- didn't know how to play it. Or the Skull Kid is referencing Saria as the 'fairy kid,' but since he already knows Saria's name, why say "that fairy kid" instead? Also, in Skull Kid's case, it isn't even a matter of Terminian counterparts: we see three skull kids as a child, and they all show musical inclination. As an adult, we can kill them and they're replaced the same as any enemy, so there are potentially many more. So it's certainly possible that they're the same Skull Kid, but I don't understand why people so often take the fact for granted. I believe HMS is from Hyrule, but not Skull Kid. I've seen enough evidence otherwise, as for myself, anyways. Well, just because he [maybe] isn't from Hyrule doesn't mean that he can't be the same HMS from OoT. I don't remember the HMS ever claiming to be from Hyrule in OoT or MM. I think he claims to be a traveller in OoT, just like he does in MM. As you've mentioned, he travels through the same path that Link takes to get to Termina; which kind of suggests that they are if nothing else, coming from the same place; I think it makes things less complicated if we just assume them to be the same HMS. I mean, what's the likelihood that the these three characters, commonly believed to be the ones from OoT, pass through the same exact path? According to the Deku Tree, the Lost Woods was a barrier to deter outsiders; assuming [perhaps incorrectly] that the forest we see in MM is beyond the Lost Woods, it would seem that the way out of Hyrule is through the Lost Woods; and that all three characters (Link, HMS, and Skull Kid) were in the process of either leaving Hyrule or returning from Termina.